The historic tugboat, the Wilhelm Baum, sank at its pier in the bitter winter of 2014. A heartbroken town watched the tug pulled from the lake. SHOUT donated $35,000 to restore the tug and add it to the Michigan Maritime Museum’s collection. The Wilhelm Baum, while not Museum owned, was enjoyed by all seeing it at the Museum dock for many years. Built in 1923, a Corps of Engineers tugboat at Sault Ste. Marie, it later served 30 years as a Coast Guard Auxiliary Rescue Boat, assisting an estimated 1,200-1,500 people. It sank at dock in 2014 - with 3,000 hours of restoration work since. 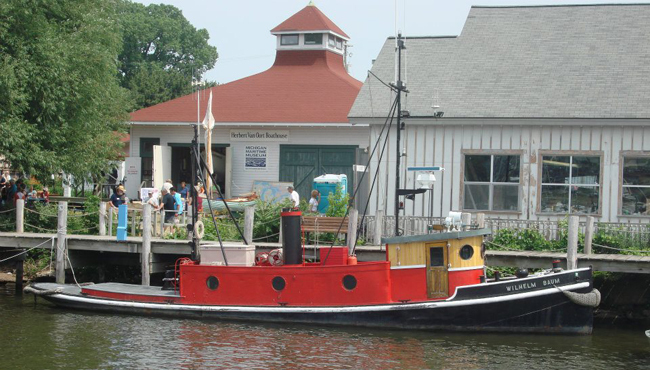 SHOUT has donated $35,000 for the Michigan Maritime Museum to add this historic tug to its collection.